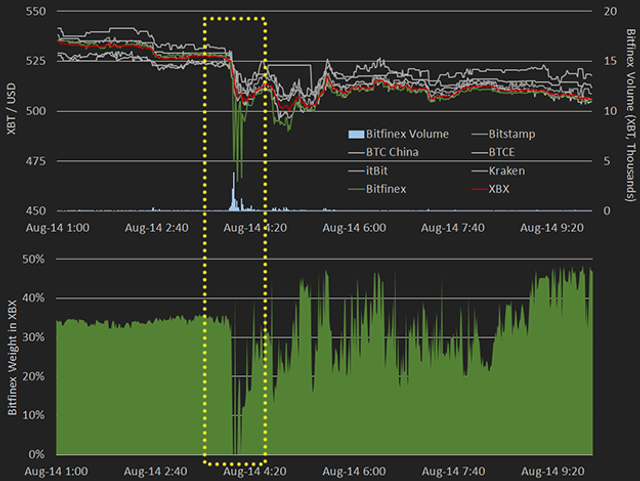 TradeBlock’s XBX index is an institutional-quality reference rate for the USD-denominated price of bitcoin. TradeBlock draws from a variety of data sources to make the XBX index the market’s most robust, institutionally-focused reference rate. In addition to data from various global exchanges, TradeBlock is also the only company in the world able to incorporate significant volumes of large, verified, off-exchange trades, the data for which is obtained through unique agreements with our institutional clients. Moreover, low liquidity in spot markets results in high susceptibility to price manipulation if a single exchange’s rate or more rudimentary index is used as a reference. With only a few million dollars worth of orders open at even the most liquid exchanges, the capital required to substantially move spot rates at a single exchange is relatively nominal, particularly if it would affect the outcome of a much larger derivative contract. Also not to be overlooked is the frequency of single-venue anomalies, wherein the rate at one exchange diverges substantially from the others. Historically this has played out in dramatic fashion, as witnessed when the price of bitcoin at Mt. Gox famously fell to 20% of the price on other exchanges earlier this year. In fact, over the last three months, each of the top three XBT / USD exchanges has experienced similar events where price at those venues diverged more than 10% from the rest of the market. (see Index Performance section below for detailed examples). In such a scenario, the rate at the divergent exchange clearly represents a dynamic of that particular venue, rather than the market as a whole.